I expect there will be a great deal of discussion about Crystal Pite’s Emergence this week, and I thought I might kick it off by offering my perspective on the work. Not since programming William Forsythe’s One Flat Thing, reproduced, have I seen such a polarizing and thought-provoking piece. As I told the dancers, it’s rare that I program a work that I haven’t seen in person, but this is one of them. I like to feel a work from the audience perspective, to feel reactions, even if I have a very different response to a work from those around me. 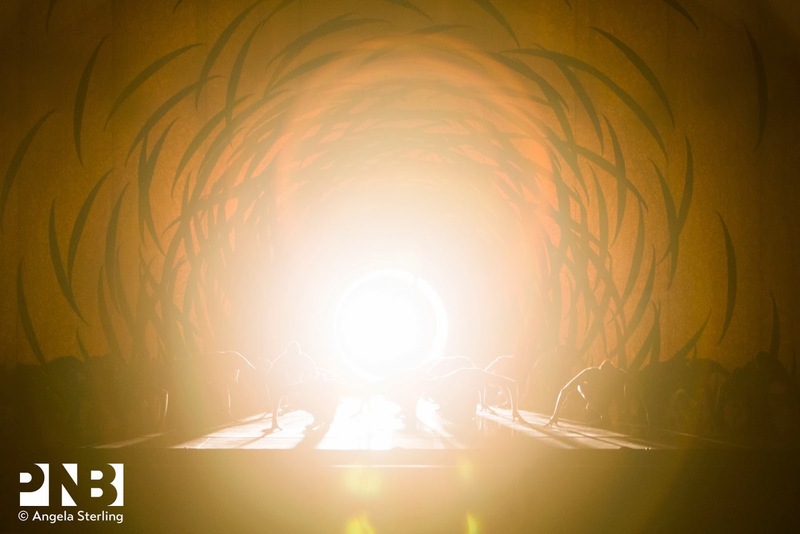 So as we head into McCaw Hall this week, I—like most of you—will see Emergence for the first time. I watched a studio run-through a few weeks ago, and it literally knocked me over. This was before Crystal returned to Seattle to sharpen movements and clarify intentions. She is a wonder, often addressing dancers while sitting cross-legged on the studio floor and jumping up to demonstrate with breathtaking clarity. She boasts no ego whatsoever, just pure unaffected example. The work unfolds systematically over 31 minutes, from a tiny urgency encapsulated in Rachel Foster’s shoulder blade. It’s one body’s movement of one muscle, but we are as focused on this tiny miracle as Joshua Grant, who’s either predator, mate, or midwife. Rachel enters our world, by shoulder blade, wing and goopy trembling limb—the birth of a creature in all of its innocence and danger. She is our window into the world of the hive. Next we meet the males, all 18 of them in spectacular muscular unison precisely angled as if in ritual prayer. They pulse and glide over surface exploring both individuality and uniformity. They are non-human and sci-fi, still masked in their anonymity. The women swarm the stage like locusts or tree ants, but they bourree on pointe in fifth position—hybrids of classicism, all clearly independent and neurotic. Their obsessive counting reaches maniacal levels, until one male enters their sacred domain and makes them individual, feminine, and vulnerable. The duet between Lindsi and Bold is less confrontational and more exploratory with the two finding their awkward tango that mirrors our human courtships. The piece unfolds in odd patterns that feel organic. We are witnessing a system both logical and foreign. The battle of the sexes is in evidence especially when an impenetrable line of women relentlessly repels attacking men. Andrew finds their Achilles heel. There’s a beautiful denouement with Rachel and three men, which explores peace and compatibility. The finale builds like Bolero, constantly magnifying the power of the masses. Thirty-nine dancers feels like hundreds—the Third Reich, the Arab spring, the sound of marching boots, and the thrill and fear of the power of many capable of a force far greater than any individual. The magnitude is also ominous, suggesting oppression, bullying, or silencing. 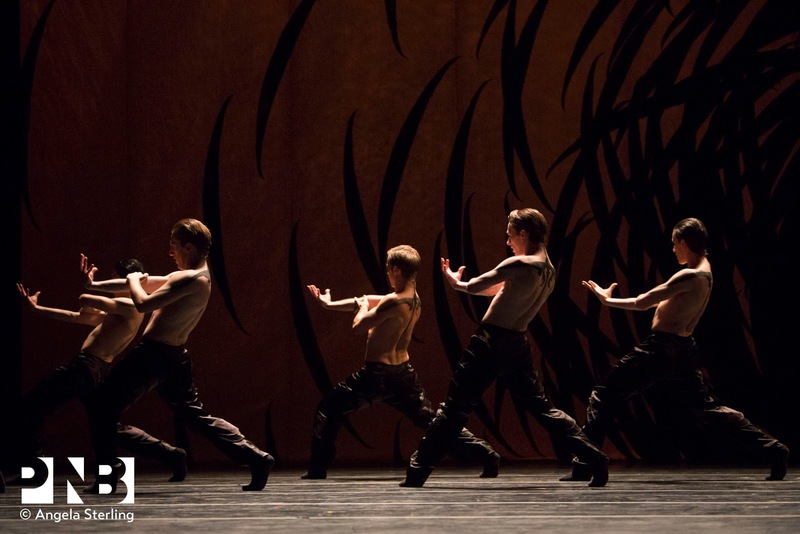 Company dancers in the PNB premiere of Crystal Pite’s Emergence. Photos © Angela Sterling. LOVED the Pite piece. Even if not for everyone, everyone benefits from this extraordinary work. My small advice to an audience maybe more comfortable with melody and more tonal music: sit back and take in the spectacle; try not to over-think toward meaning; let the amazing movements, synchronicity and color contrasts envelop you. You’ll feel some awe and also in time see the remarkable things Pite has accomplished–mass and individual the struggle and the beauty. I cannot imagine the mind and the courage that created this dance; and the individual PNB dancers depth and grace, athleticism and body memory that delivers this impactful experience and vision. Thank you. GO! You won’t regret the transporting experience. And what is stage work about? Taking us out of ourselves to find ourselves and others. This piece delivers! Thank you!